Discussion in 'Investment casting Ceramic shell method' started by 01binary, Jul 2, 2018. ...and that's it. The quality is good enough for me, since it will be primed and painted, so any minor co-planar defects can be easily filled and re-polished as long as they don't occur on edges or complex geometry. Thanks for the incredible amount of support here! I am working on my first metal casting article for UltraVest and will probably publish that after my project is done. Then I can start on the second article describing shell casting. Jimmy Cogg, Rtsquirrel, Mark's castings and 2 others like this. BINGO. Awesome work. You nailed it. I believe that is about as good as it gets. Yep, that second pour is outstanding. Great result 01. For clarification, and assuming you are still pouring aluminum, what temperature did you preheat the shell to? Was the shell temp 780F or was the pour/metal temp at 780C? Wow that second casting came out really well. So it seems a cold shell isn't quite as good as a warm one? Wow that second casting came out really well. So it seems a cold shell isn't quite as good as a warm one? That is a safe assumption, the trick with aluminium is how hot is the right hot? You are right, that pyrometer doesn't have a Fahrenheit mode, it's always in C. Melt was around 800C (1472F) and I poured in 30 seconds with ambient temperature of 84F, with approx 1.5 degrees lost every second. I must have been down to 750C (1382F) when I was pouring. 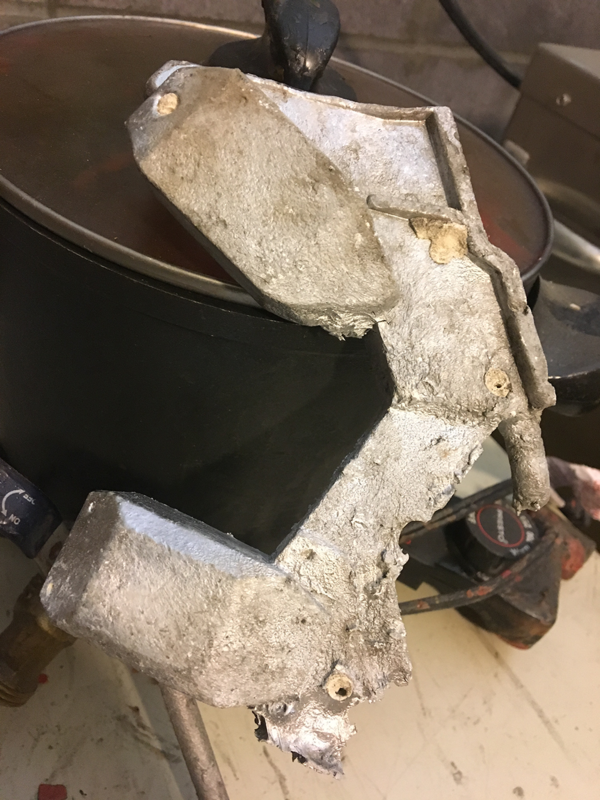 I guess that's still not correct because the rate of cooling changed when I took the crucible out of the forge (maybe up to -3 deg per second) and then further in the middle of pouring as the stream of metal went through the air into the cup (probably -10 deg per second). I will try to get some graphs going next time I pour. Since temperature makes the difference between getting total garbage and a really nice part, it's worth documenting it here for anyone else who needs to do it. 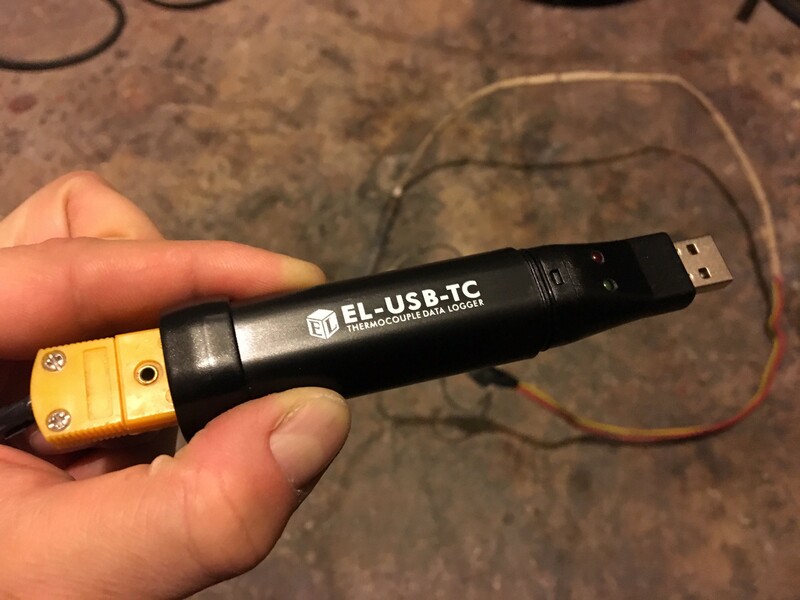 I ordered a USB temperature logger and went through a tutorial on rendering a live temperature feed on a video, I think I can get this rolling for next time. Now that would be just too cool!! Your first pour (cold shell) "what the frick!!" I have never see something so ugly. It looks like nothing but dross. I'm impressed the shell didn't blow apart! Aluminum cools so fast it's not funny. My bronze stuff is still screaming hot 30mins later on breakout. I don't water them because I've gotten cracks. Since I nailed down a pouring temp, my surface finish and structure is first class. With all this time and labor, you better get smart fast. Binary looks to have ironed out the nitty gritty. Good on him! That would be great 01. Documenting the pour temp of the alloy and soak temp of the shell would be very useful information given the dramatic impact it has on results. I know you have a kiln. Out of curiosity, do you know the soak temp used on your second pour? The kiln was showing something around 800F when I wrapped the shell in a ceramic blanket and took it outside to a 68F ambient temp. I must have spent 2 minutes fumbling around, so it probably dropped to 650-680F when I poured. I don't have anything recorded precisely so I estimated the temp on the video. I am consistently seeing a loss of ~1 deg C per second when in ambient. The crucible was showing 800C (not F, oops) according to the pyrometer so it probably went down 60C degrees or so, to something like 1364F. I will attempt to record the kiln, the crucible, and the shell temp live (and in same units). As always, bridging a gap between what I want and what I actually can do may take a while, but I'm pretty sure I can get this all working eventually. I am taking this weekend off because the flu vaccine is making me feel like a shredded garbage bag. To record the kiln (for only 15 seconds or so as I take the shells out) I was thinking about having another camera trained on the digital temp readout below the door, and after I sync both cameras I just animate a text overlay value to change manually on the final video (go frame by frame and change the text in the textbox when the readout changes). Rotoscoping in this fashion doesn't take much time, especially if the operation you have to repeat is simple and it doesn't last for too many frames. I can do the same thing to display the shell temperature - a laser meter with a dot trained on the shell, and a fixture made from a cannibalized cellphone selfie stick that can keep a cell phone trained on the laser meter readout screen. That can be rotoscoped and synced as well. In the future I can add a USB laser temp logger, if I find myself doing this a lot. 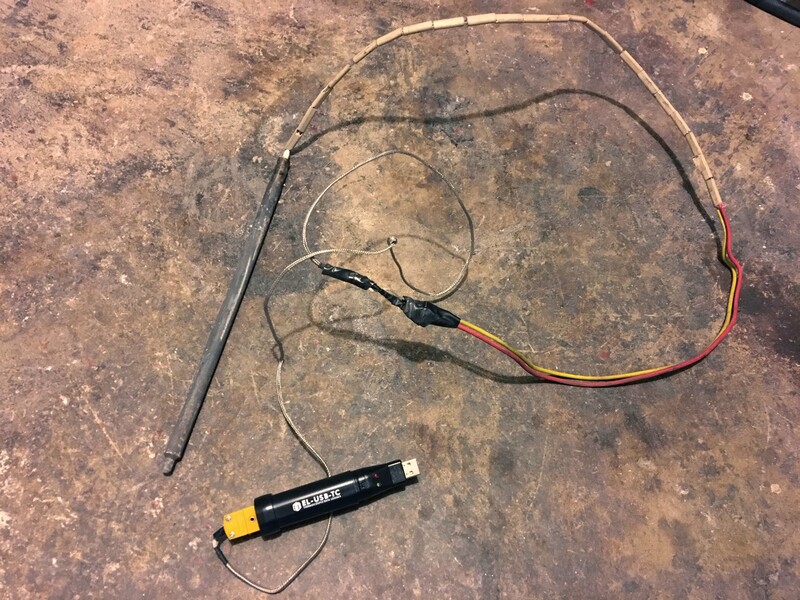 Lastly, I can start with the USB pyrometer isolated, and then put it inside the forge to create a sync event (i.e. all of a sudden the numbers start going up), so I know when to start animating the CSV data stream it outputs. AfterEffects can animate vector artwork representing measurement gauges by using expressions, with angles mapped to values read from a CSV file by some formula. For example, you can draw an arrow on the gauge as a separate layer, set its pivot point, and then bind the rotation to some expression, like 10 degress + temperature in Celsius * .25. All of the gauges can be on separate 3D layers, because with camera tracking you can position 3D objects inside the space of the video that was shot, and it will correctly move them frame by frame so it looks like they are part of the scene. I did the same kind of 3D tracking text effects for this video I shot last weekend: https://www.facebook.com/vnovytskyy/videos/pcb.10211443799403813/10211443766522991/?type=3&theater. You must be MacGyver. That is pretty impressive. I wanna see the data of the pour. Super interesting. I have some mixed news from my attempt this weekend. I got all the data, but the act of observing the temperature and filming combined with more trouble from my regulator caused a decline in casting quality. I suspect it mostly came down to metal that got too hot, thus absorbing more gas from the atmosphere. I also had to move the camera and take laser temp readings, so I didn't remove the mold from the kiln as quickly as last time, and didn't pour as quickly. 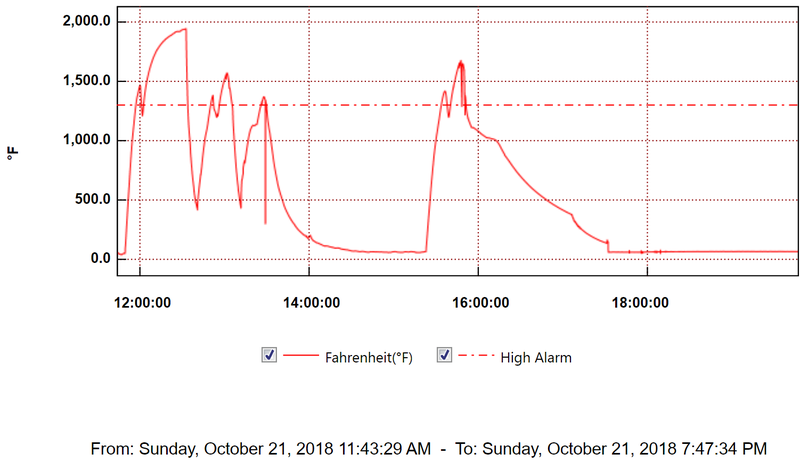 One interesting note: for that last pour, I left the probe inside the shell as the metal was cooling, so the graph captures actual metal cooling rate over 2 hours. 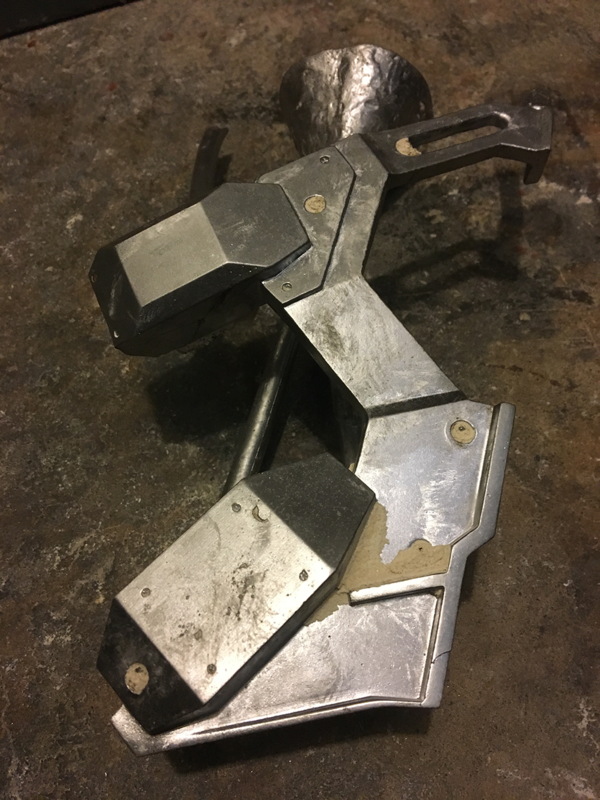 I had to cut off the pouring cup with a steel cutter after it hardened, and going to re-melt it to free the probe next time I do casting. Tobho Mott and Jason like this.